Whether you’re renovating to sell or to rent out an investment property, the object of the exercise is to make money. If you’re planning to sell after renovating then increasing the home’s value should be your goal, while if you plan to bring in tenants then you’re after maximum rental returns. Either way, the golden rule is to spend less than you will make from the project, so how you renovate is vitally important. This guide describes what kind of property to look for, some of the things you’ll need to consider to make your renovation happen, and some useful tips when tackling the renovation project itself. The ideal renovation project is an investment property that can be purchased for less than market value, and to find it you’ll need to do your research. With your ideal buyer or tenant in mind, look at the demographics of the area you plan to buy in. What are the average house prices? What kind of amenities does the area have? What kind of public transport, recreation facilities, major shopping centres, etc? What is the potential for future growth? If you visit every auction that comes up in the area and attend every viewing over a period of a few weeks, you will get a good idea of what the true property values are. This will put you in the perfect position to spot your bargain renovation property when it appears. Once you find it, if you already have your finance organised then you will be able to move fast and hopefully negotiate a long settlement with the seller. The longer the settlement time, the longer it will be before you have to start paying a mortgage and the more time you will have to renovate. If you can obtain a lengthy settlement time and have access to the property to renovate during that period, you could theoretically have the property ready to sell or rent before making your first mortgage payment. Unless you are a builder, you are going to need people who can help you make your renovation project a reality. You will need contacts who can help you with building permits and council red tape. Depending on the size of the renovation, you will also need someone to project manage and tradespeople to perform the various tasks that you can’t do yourself, such as electrical work, plumbing, bricklaying and carpentry. Of course, the most cost-effective renovations are those where only cosmetic touches are required to transform a tired or rundown property into an attractive home. If you manage to find one of these, then you may be able to reduce your costs substantially by doing a lot of the work yourself. You should still seek professional advice wherever you can, even if it’s just from a friend with an eye for design or someone with previous renovation experience. Knowing what to renovate is half the secret to pulling off a successful renovation project. Renovating successfully means spending as little as possible to make the biggest return on your investment. Experts recommend not spending more than 10% of the property’s current value. With that in mind, here are some cost-effective ways to achieve the best possible result without going over your budget (which should include an extra 10% for those inevitable delays and unforeseen expenses). Always buy good fittings, as these are the things that create an attractive overall impression. Spending a little more on taps, doors, handles, tiles, window furnishings and light fittings, and less on major structural changes, can add significant value for much less outlay. Good quality fittings can be sourced from various places such as auctions and online, if you take the trouble to find them. Don’t forget the garden. A great way to add value quickly and easily is to give the garden and backyard a makeover. Clean or repaint paths and fences, plant new flowers and shrubs, and put in some pot plants and the occasional piece of furniture to make it a welcoming oasis. Create a good first impression. The entrance is the first thing a buyer or tenant sees, so make it welcoming by cleaning up or replacing the front door, and giving the exterior of the home a wash and a fresh coat of paint. First impressions are important, and kerb appeal sells homes much faster. Renovate with your ideal occupant in mind. If it’s a family, make sure there’s plenty of cupboard space and room to move, while if it’s a tenant then Internet access or a lockup garage may be more important. Visualise who will be living there and add touches that will appeal to them. Do one room at a time. If you break the project up into do-able segments, concentrating on one room at a time, you will see progress more quickly and thus be inspired to keep working. If you are doing scattered jobs all over the house, you will work less efficiently and may lose enthusiasm along the way. Do the laundry first. If it’s your first renovation and you don’t have a lot of hands-on experience, do the laundry first. It’s usually the least used room in the house, and little mistakes you might make while learning various skills will be less noticeable in here. Capitalise on existing features. Every home will have at least one unique feature, such as a beautiful tree, a feature window, a classic fireplace or a big deck. Highlight those features and make them a focus. Use renovation apps. 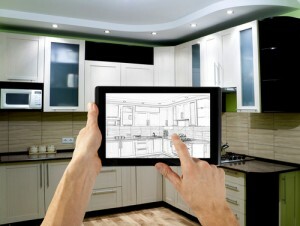 There are several great apps available that can help renovators immensely, including Paint My Place (try over 30,000 different paint colours), DIY Handyman Toolbox (does common handyman calculations for you) and Houzz Interior Design Ideas (access to 1.5 million different design ideas). The secret to a successful renovation is to buy cheaply, renovate wisely and maximise the return on your investment, and hopefully this guide has given you a few ideas on how to achieve all three of these aims when undertaking your next renovation project.